Donald John Trump was elected the 45th president of the United States last night in a stunning culmination of an explosive, populist and polarizing campaign that took relentless aim at the institutions and long-held ideals of American democracy. 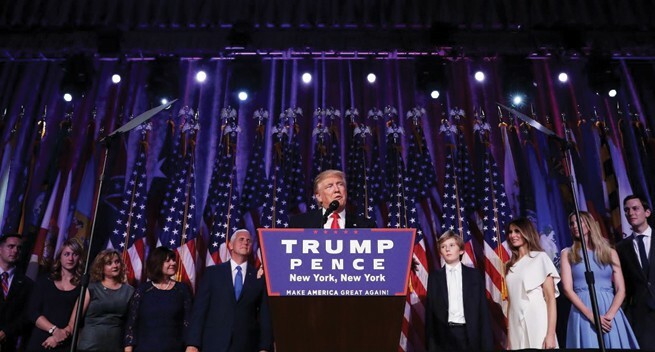 New York Times reported live that the surprise outcome, defying late polls that showed Hillary Clinton with a modest but persistent edge, threatened convulsions throughout the country and the world, where skeptics had watched with alarm as Mr. Trump’s unvarnished overtures to disillusioned voters took hold. The triumph for Mr. Trump, 70, a real estate developer-turned-reality television star with no government experience, was a powerful rejection of the establishment forces that had assembled against him, from the world of business to government, and the consensus they had forged on everything from trade to immigration. The results amounted to a repudiation, not only of Mrs. Clinton, but of President Obama, whose legacy is suddenly imperiled. And it was a decisive demonstration of power by a largely overlooked coalition of mostly blue-collar white and working-class voters who felt that the promise of the United States had slipped their grasp amid decades of globalization and multiculturalism. Meanwhile, Papua New Guinea Prime Minister Peter O’Neill , has extended his congratulations to Donald Trump following his success in the vote count yesterday in the United States Presidential Election.